Suede was one of the biggest trends for Fall and Winter and I’m here to tell you that suede isn’t going anywhere for Spring! This BLANKNYC olive suede moto jacket was my best purchase of last year and I’m so glad that I’m able to make it work for multiple seasons. The weather in New York has been crazy and while I’m desperate to wear all my warm weather favorites, most days it isn’t quite warm enough yet. This silky top and maxi skirt combo is one of my favorite outfits for Spring and Summer, but since I can’t wear it on it’s own yet this suede jacket was the perfect addition. Moto jackets are just one way to wear suede in Spring. I wouldn’t pack away your suede skirts (especially minis) and suede handbags just yet either. When paired with light airy fabrics like I did here, suede skirts and bags would be perfect for Spring and even Summer! One suede item I can’t wait to break out are my favorite platform suede sandals! I got a chance to wear them in Austin last month and they are the ultimate 70s inspired Spring shoe. This is such a cute look! I love the suede jacket and maxi skirt combo – so so cute! I for one completely agree with you — especially for these early chilly Spring days, suede is ideal! I am dying over how you dressed it up here, love that olive color and the tank-maxi skirt combo is inspiring me. Beauty!! This is such a beautiful look! I agree, suede is always appropriate, and you rock it well! Absolutely gorgeous outfit. Perfect mix of organic patterns on skirt and animal print shoes. Love it ! I wish I owned that blank jacket. I’ve been wanting one for so long! Love the maxi skirt as well. This is adorable! I love suede especially when it comes to shoes so I so agree!! I’ve had my eye on those BLank jackets for forever now…they’re SO gorgeous!! I’m completely obsessing over this entire outfit. The printed maxi skirt caught my eye immediately, and you were so brilliant to pair that olive suede jacket with it! Plus the mixed pattern with your flats is super cute! Can I just steal it all? Haha! Great spring look, love the jacket. Suede in the spring is perfect! I love this moto jacket. I have that jacket in brown and love that you can wear it all year. Loving that skirt! You can 100% wear suede in Spring! I have been loving suede this year! I like the idea of taking it into spring, too! 🙂 I’ll have to give my booties some more loving this season. Thanks so much for sharing! I’m dying for that suede jacket! I love suede and totally wear it year round. That maxi dress is just beautiful on you! I agree, that jacket can be worn no matter what season it is! I love the suede! This moto jacket is gorgeous on you! I love Blank NYC! That suede jacket is gorgeous!!!! It’s perfect with this beautiful maxi skirt! Love wearing Suede in spring! Such a gorgeous outfit! You look lovely! I love how you paired the feminine maxi skirt with more edgy jacket – such a great look, especially for these chilly Spring days! you look gorgeous!!! i love this jacket so much. 1 in all 8 colors please! Hellooooo outfit crush! 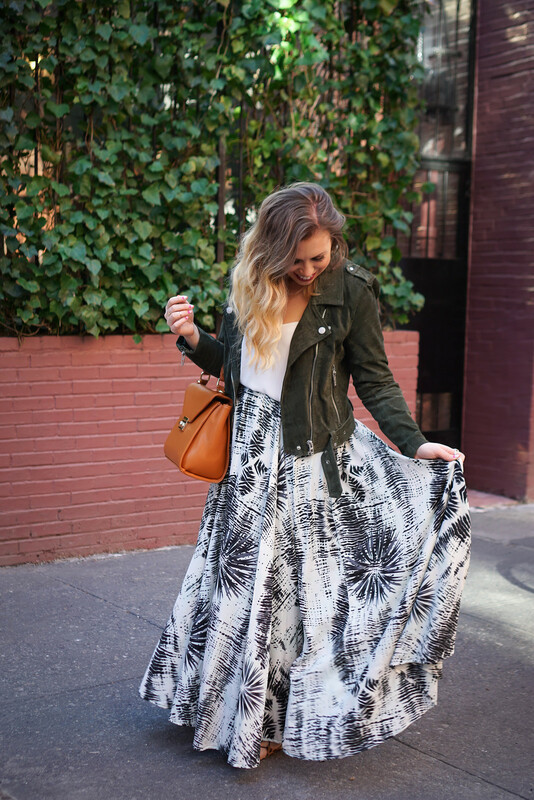 You look stunning and I want to steal this maxi skirt from you! That jacket (heart eyes) I’m all for wearing suede in spring, it’s perfect for layering, especially on chillier mornings or nights! obsessed with that skirt! and i love those leopard flats too!